ABI (Auditory Brainstem Implant)- An Auditory Brainstem Implant (ABI) is an electronic device like the cochlear implant but it is different as unlike the cochlear implant that stimulates the cochlea, ABI stimulates the brain stem. ABR (Auditory Brainstem Response) - ABR is a test performed by an audiologist to measure brain's response to sound. Auditory Nerve (Cochlear Nerve)- Auditory Nerve, also known as cochlear nerve is a nerve that carries signals to the brain. Acoustic Trauma- The inner ear is quite sensitive and can be damaged when exposed to loud noise. This is known as acoustic trauma. ALD (Assistive Listening Device)- Devices that are used to process, transmit and amplify sounds are known as ALDs. Usually, hearing aids are not termed ALDs. They also help to eliminate background noises and bring sound to the inner ear. Alerting Device- Alerting Devices are used by people with hearing loss. These devices vibrate or flash to indicate about the sounds or events that have happened. Background Noise- Any noise that interferes with what a person is trying to hear is termed as background noise. Background noise often makes it difficult for the person with hearing loss understand the speech. Basal Region- Basal region serves the purpose of detecting high frequency sounds and sending them to the brain. Bassilar Membrane- Bassilar membrane is the central membrane in the cochlea. Hair cells rest on it and it is contained within the organ of coti. Behavioral hearing tests- Also known as Behavioral Observation Audiometry, it is a hearing test used with children. A child's reaction such as head turning and eye opening is observed, but since results can be affected due to the observer's bias, it is better used along with some other tests. 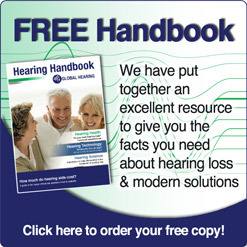 Bilateral Hearing Loss- Hearing loss in both ears is referred to as bilateral hearing loss. Binaural Hearing- Ability to hear with both ears. Binaural Hearing Devices- hearing devices worn in both ears simultaneously. Body Aid- This is the largest and the most powerful of all traditional hearing devices. It is as big as a pack of cigarettes and can be worn on the belt on kept in a pocket. A small wire carries the sound to the earpiece. Bone Conduction- Mechanical vibrations carried to the ear through the bones of the skull is referred to as bone conduction. Brain Fog- Brain Fog is a term that refers to the side effects of damage to the vestibular system such as groping for words, forgetfulness etc.